If you’re thinking about adding some homemade ornaments to your Christmas tree, it’s not too late to get crafty. 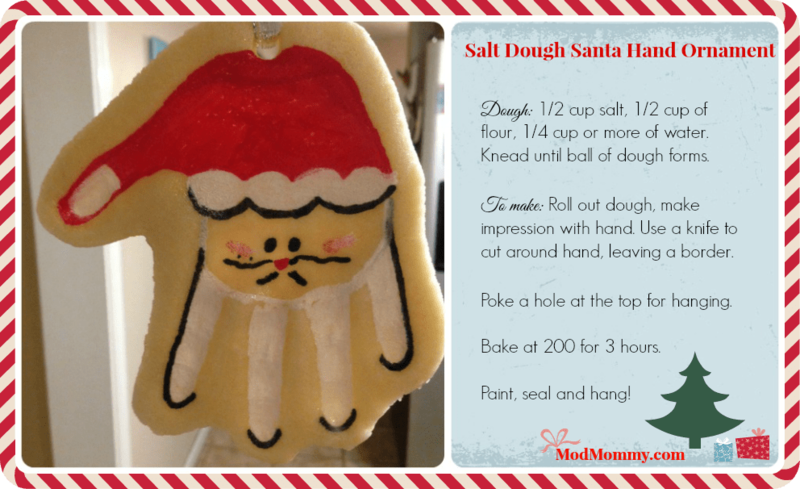 Last year, I made an adorable salt dough hand-print Santa with my then 3-year-old. That post has been pinned dozens of times on Pinterest, and still proves to be a winner. I wanted my almost 2-year-old to have something special on the tree, so I had to think up something similar. I could not find how to make a hand-print reindeer anywhere that I liked, so this is my version. And since I didn’t want a million hand ornaments on my tree, I thought something with fingerprints would be fun for my 4-year-old. I saw something similar on Pinterest where you could make this ornament with thumbprints from the whole family. However, my ornament has fingerprints from one person. Knead until ball of dough forms. Washable kids paint or acrylic will work for coloring the dough. I did not experiment with food coloring, but I’m sure it will work just fine. 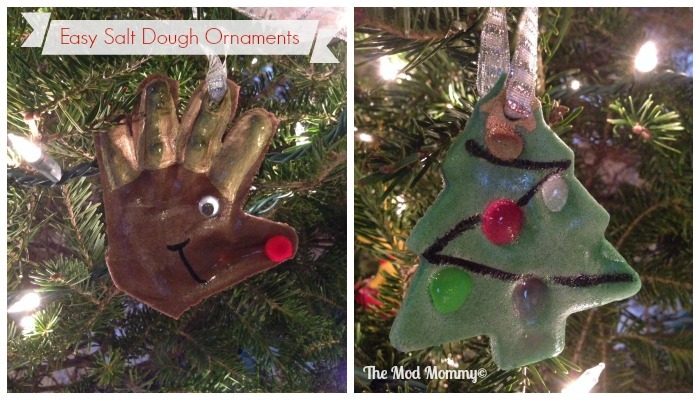 Separate your dough in two bowl if making both ornaments. Add paint a little bit at a time. And knead it and work it until the dough changes color and is even distributed. Roll out dough, make an impression with hand. Parents, use a knife to cut around hand, leaving a border. Poke a hole at the top for hanging. Bake at 200 degrees for 3 hours. (I like to flip my ornaments over half-way through). Paint the antlers using paint markers or a paintbrush. Draw in the mouth. Seal the ornament with a gloss finish spray. Let that dry. Roll out dough, use a Christmas tree cookie cutter for shape. Use a sharp edge tool like a knife or chopstick and gently make the string for lights in the dough. This will help you when you paint it later. Using each finger, I started with the thumb first on the bottom right light, and press your child’s fingerprint along the light strand. A couple of tips that will help make this even easier. 1. I bought acrylic paint markers at Michaels. They help you be precise and are not messy! 2. I used a chopstick to poke the hole. 3. I used a sealer with a gloss finish in a spray can. That was also found a Michaels. This easy Christmas craft is suitable for kids of all ages. Just keep in mind, if doing the hand-print ornament, the bigger the hand, the heavier the ornament!